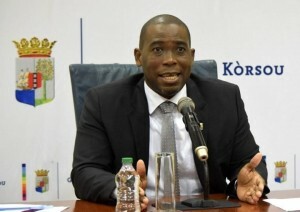 WILLEMSTAD - The opposition is trying to gain political capital from the drug robbery from the Rio Canario police station. This is according to the Minister of Justice Quincy Girigorie. It was about 500 kilos of cocaine that was stored in a safe. Unknown people managed to force heavy metal doors, to get to the safe with the confiscated drugs. From the opposition, there were voices that insisted on the resignation of the minister. "It is unfortunate that politicians use these moments for cheap politics," says Girigorie. His job is precisely to deal with such incidents. He has to be judged on that, says the minister. He points out that such events can take place anywhere. Coalition party MAN has asked yesterday in a press statement what measures Girigorie will take to combat the attacks on judicial institutions. The party has submitted an application for an emergency meeting of parliament on this subject.